I stumbled across Cartwright and Butler at the recent Food Expo in Birmingham. In their huge stand were an array of deli eats, but most notably their Triple Chocolate Chunk Biscuits (£4.00). Cartwright and Butler are a Yorkshire based company who specialise in fine foods. Their Triple Chocolate Chunk Biscuits are one of their new products, and I have been lucky enough to try them. Firstly, they're presented in a traditional biscuit 'tin', with a Kilner-like clasp lid, which keeps the precious biscuits fresh. Pop the lid open and you'll reveal twelve perfectly-formed, each one slightly different from the previous - a sign of hand-made biscuits. They're the perfect size - about the size of the leading biscuit in the UK market - and fit neatly in your hand (the sign of a proper biscuit). Instead of a dense chocolate flavour, they're very much a biscuit, that have a good dipping quality, crunch, and flavour. The triple chocolate comes in the form white, milk and dark chocolate. There small chunks of white chocolate, which is wonderful to bite into, studded throughout each chocolate biscuit. 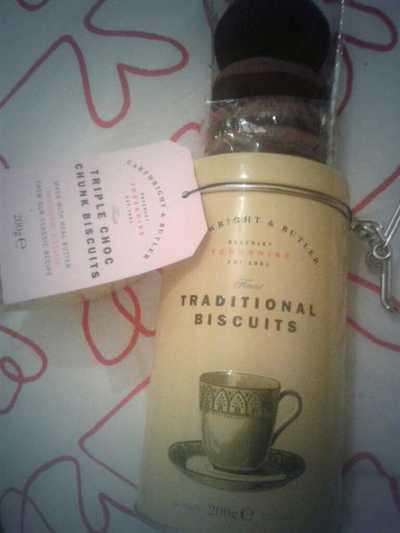 Buy these biscuits from Harrods, Selfridges, Harvey Nichols, or John Lewis.